Score one for truth, justice and the American Way. Yes, that’s Superman’s motto, but it’s never been more fully inhabited, more sincerely realized, than in Joe Johnston’s trip to the Marvel Universe, Captain America: The First Avenger. Come Monday morning, every kid in America will want to be him. And if they don’t, their parents will wish they would. Some might call Steve Rogers (Chris Evans) a bland character, but Dr. Abraham Erskine (Stanley Tucci) gets it right – he’s just a good man. 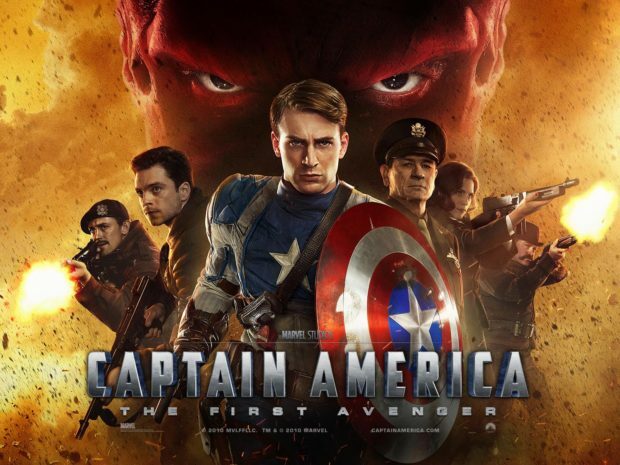 And Captain America: The First Avengeris a good movie. Actually, for the first time (at least in my head), we can call a Marvel movie a good film. Every step of the way, Johnston pushes the emotion just far enough, never stepping over into mawkishness. This is one of those films that is the way they used to make ’em, except they never did make ’em like this. Cleverly, the script by Christopher Markus and Stephen McFeely starts in the present day, as the military uncovers a futuristic craft crashed in the snow. As they explore, they stumble across a block of ice familiar to readers of Captain America, the only thing exposed, that iconic red white and blue shield. And then it’s 1942, and we have a thrilling story to get through before that trapped shield can be explained. The spindly Rogers has tried to enlist in the Army four times; with good men laying down their lives in Europe, he just wants the chance to do the same. On his fifth attempt, he catches the attention of Professor Erskine, who taps him for the experimental super-soldier formula. All of the beats from Joe Simon and Jack Kirby’s original 1941 comic book story are there, with moments fleshed out to satisfy modern sensibilities. But Johnston keeps offering up nods to the source in subtle ways; after capturing a Nazi spy, Evans’ now muscular Rogers stops to marvel at himself in a pose straight out of Kirby. Actually, one change made, and absolutely necessary, is to separate the film’s villains from the Nazis. Not that this somehow absolves Hitler and his followers, but through Johann Schmidt, the Red Skull (Hugo Weaving), a new even worse group has arisen: Hydra. We are in a comic book world, flashing back to show the foundations of the reality that Iron Man, Incredible Hulk and Thor had explored. It’s a thrilling World of Tomorrow as seen through the lens of yesterday, led by Howard Stark (Dominic Cooper), a character much like his son, but on a path to being the distant genius that earlier movies had given us. Through it cuts the steady moral compass of Steve Rogers, steadfast and true to his ideals. 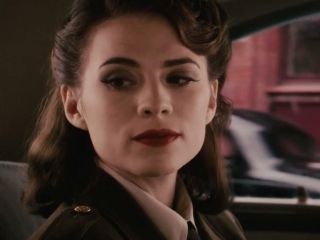 The film hints at potential romance with Agent Peggy Carter (Hayley Atwell), played delicately and believably chaste. Maybe Twilight could learn a thing or two about showing character’s conflicting desires without hammering them home. Yes, the characters are writ large. In addition to the Red Skull countering Captain America (and, oh, how it’s satisfying to see), Toby Jones pops up as simpering secondary Hydra scientist Arnim Zola. 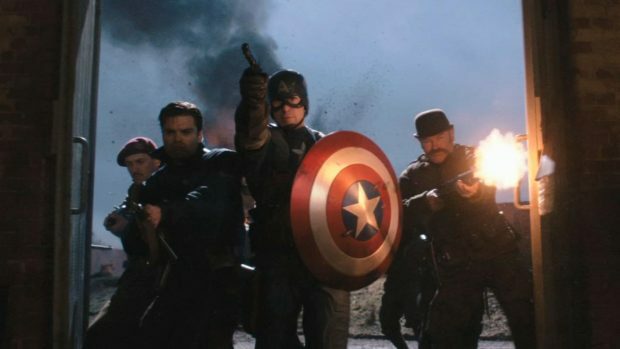 On the side of good, though never called this, the Howling Commandos will follow Captain America into the bowels of Hell if they have to. Among those Commandos is Rogers’ best buddy from Brooklyn, James “Bucky” Barnes. The cinematic changes to Bucky make perfect sense, and their friendship only strengthens the certitude of Captain America. If you’ve ever thought the character sounded hokey, this film just shows you that pure moral fiber can be something worth shooting for. 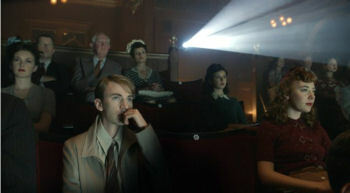 And that fiber is fully inhabited by Evans, in a 180 turn from his usual screen roles. There’s not a hint of cockiness to him at any point, no matter how great his successes as the Star-Spangled Avenger – though that nickname is a bit of a misnomer. He’s not avenging; he’s just doing what’s right. When the amazing CG work renders him into the 90-pound weakling at the beginning, he’s incredibly believable as the guy just wanting to do his part to stand up to evil. What makes this so strong is that not once does the film tailor the part to fit the actor. He has to disappear into the hero completely, and does. The film itself never disappears into its comic book origins, but Johnston clearly has affection for them. If you blink, you might miss an appearance by the original Human Torch, and for a fleeting moment you might hold out (fruitless) hope for Namor the Sub-Mariner to drift by. The director also manages to nod to Jack Kirby’s wonderfully crazy design for Arnim Zola, though this time he stays a regular human. 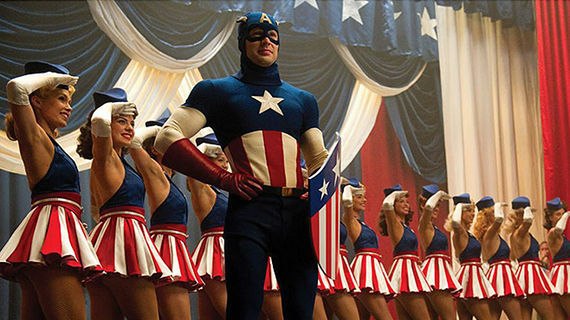 We’ll also hold out hope that Captain America: The First Avenger will get a nomination for Best Song, thanks to the USO sequence that gives fans a bright red white and blue Captain that admittedly looks silly, but that still inspires Rogers to adopt a uniform somewhere between his comic book original and the Ultimate Universe one. It’s a work with an unabashed love for its source material, and a director who understands how to communicate that to a wider audience. It may not make you believe in superpowers, but it will allow you to believe in heroes.